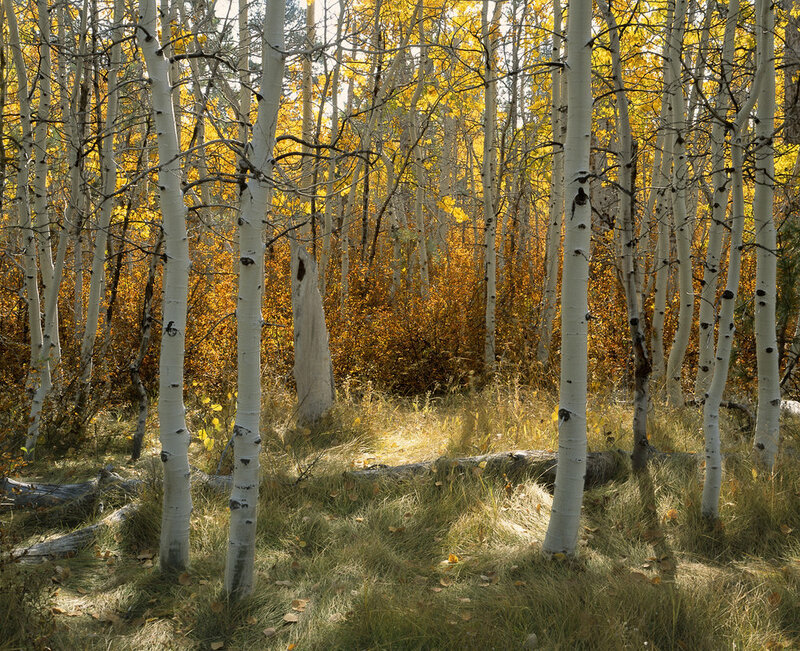 While out scouting I walked along the edge of the aspen grove. I like the perspective of "looking in", which I did take advantage of for this image. This also makes it possible to take in the larger view, and then move in closer for more intimate landscapes that may grab your eye. This is when I came upon the "opening" around which I composed Late Fall in the Aspens. The opening is a gap between a few larger aspen trees. As our eye moves between the trees, the light colored, and brightly lit, meadow grasses in the "entry" draw the eye in. Our eye naturally goes to the brightest/lightest element in a scene first. This open, bright space welcomes us into the forest. To accentuate this, I purposely used a "normal" focal length lens placed at eye level on the tripod to enhance the feeling of the viewer being able to walk right in to the scene. The next aspect of the scene I was drawn to was the layering. My eye was immediately drawn to the layers, front to back, of meadow grass, rust colored undergrowth and yellow aspen leaves. There were two elements here, light and color. Yellow grass (light), orange undergrowth (dark), yellow aspen leaves (light). This layering adds both a sense of depth, as well as visual interest. Finally, but not at all least, is the direction of light. I placed my camera at an angle looking directly toward the sun. There were several reasons for this. First, it eliminates any harsh highlights on the sides of the white aspen trees. Those highlights can distract the eye and make the overall scene harshly contrasty. Not pleasing to the eye at all. Second, backlight on foliage, especially colorful fall foliage is magical. Backlight transformed this scene into a vibrant composition with a greater feeling of depth. As a side note, I did wait for the sun to be high enough in the sky to shorten, and even eliminate many shadows that would have introduced too strong a level of contrast. I wanted the scene to glow and have depth, but still have a continuity and delicateness that was inviting. This is the basic process I went through in the composing and capture of my newest release, Late Fall in the Aspens. I hope it gives you some insight into how I see and what I look for in such a challenging, but potentially rewarding photographic situation. Now get outside and put these tips to good use in your photographic experiences.